121” wide x 82” deep x 126” high. 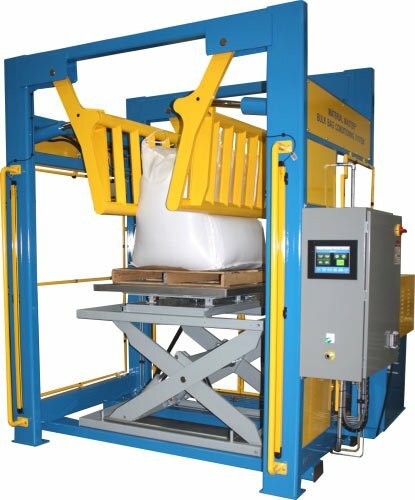 Powered rotary lift table with 48” of travel and 4,000# capacity allows complete conditioning of a wide range of bag sizes. Machine features acrylic guards on three (3) sides with a load side light curtain for operator safety. NEMA 4 electrical control panel with a customer requested Automation Direct PLC and HMI. Variable frequency drive and proprietary PLC program delivers accelerated equipment cycle times. Parker hydraulic system with dual pumps, 10 HP motor, and enclosure with sound deadening insulation.